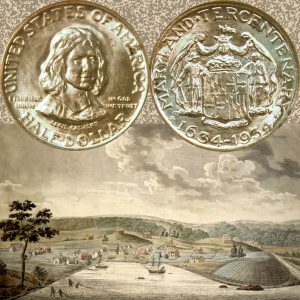 Today, the Maryland Tercentenary Commemorative Silver Half Dollar Coin remembers the survey of 60 acres on January 12, 1730 that became the foundation of a town then a city. The city of Baltimore unlike most cities is not located in any county. The land area in 1910 was 30.14 square miles. By the annexation bill of 1918 there was added from Baltimore County 46.18 square miles and from Anne Arundel County 5.65 square miles, making a total land area of 81.97 square miles. The population of the City (U. S. Census) on January 1, 1920, was 734,205. To begin at the very beginning of direct historical information concerning Baltimore, one must go back to the year 1608. On June 2, 1608, Captain John Smith, whose life is reputed to have been saved by Pocahontas, having settled Jamestown, started from the vicinity of Cape Henry on the first of his two famous explorations of the Chesapeake Bay. During this expedition, which lasted 19 days, he visited every inlet on both sides of the Bay, from the Cape to the Patapsco River, (named by Bolus Smith,) sailed up that stream, and from him we get the first information concerning the region now Baltimore. Smith and his followers were, therefore, the first white men to set eyes on the present site of the City. There is no question about Smith’s visit to this locality. He prepared an excellent map of the Chesapeake and its tributaries. The Patapsco River, then, of course, unnamed, he called “Bolus” because of the red clay resembling “bole armoniack” along its banks. The red clay, or “boIe” was a covering for deposits of iron ore, afterward discovered and mined. The first of these mines was owned and worked by John Moale, at Moale’s Point, along Spring Gardens. Smith’s map indicates quite an extensive knowledge of the topography of this section. He went up the “Bolus” for considerable distance. On his voyage he had 14 companions and used a barge of between two and three tons, propelled by sail and oar. He had exciting and interesting experiences with the Indians. Following Captain Smith’s explorations in this vicinity, there is a lapse of years before the thread of the narrative can be taken up by the historian. In the absence of proof to the contrary it must be assumed that Indians roamed over the site of Baltimore at will or at least without interference from white men; for it was not until 1661 that history records the second step in the advance of civilization. In 1661 the first surveys were made, pursuant to land grants, and henceforth this section became the permanent habitation of white men. Tract after tract was taken up by settlers, and in 1706 Locust Point, the “Whetstone Point” now within the City limits (Southern Section,) was made a port of entry. Iron ore de posits had been discovered near the Point in 1723, which produced trade and attracted population. Baltimore town site, some miles to the Northwest, was laid out pursuant to an Act of Assembly, approved by the Governor of the Province, August 8, 1729. A commission was, by this Act, appointed to select a site. This body met on December 1, 1729, and on January 12, 1730, the official survey was made. The original tract, part of “Cole‘s Harbor” consisted of 60 acres, divided into 60 lots, which were sold by Charles and Daniel Carroll for 40 shillings an acre— tobacco being accepted in payment at the option of the buyer. Three years later the same assembly ,authorized the laying out of Jonestown, (Old Town,) on the opposite of Jones Falls. In 1745, the two towns were consolidated. The town grew slowly but surely. In 1752 it comprised only 25 houses and 200 inhabitants; but a year or so subsequent, an impetus was given to its development by the shipping of wheat, loaded in its harbor, to Scotland. In the war between England and France, some of the wandering Acadians found Baltimore Town a place of refuge. By the beginning of the war of Independence, the population had grown to 6,775. The new settlement was named in honor of Cecilius Calvert, (Lord Baltimore.) The tract is in the heart of “the down-town” business section today. The city was incorporated in 1790, and received its first Charter the following year, having been previously governed from Annapolis by means of commissions with very limited powers. In 1797 Baltimore passed from a town form of government to an incorporated municipality, with the “Mayor and City Council” as the corporate entity. Under this form it has since remained. The Maryland Tercentenary Commemorative Silver Half Dollar Coin shows with an artist’s image of Baltimore, circa 1752.